Why can't I paint any of the wedges with the Ender IO painting machines?! Its a sad sad day :( I also can't get the wedges rotated horizontally, which makes me equally sad. Great job excellent idea. Would be nice if you can add a dirt wedge, to do some real nice terra forming. The dirt wedge is in. Also added grass wedge and grass path wedges for nice up and down-hill paths. 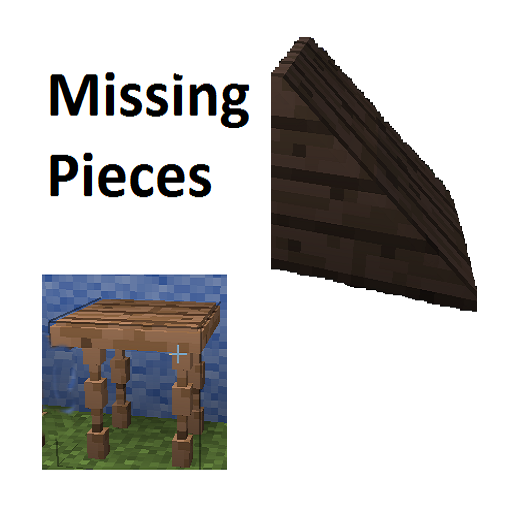 "The Missing Pieces mod is for Minecraft 1.8"
oops nevermind not the candelebra's fault. it was hanging too close to my fired cauldron apparently. Can you give me more info so I can reproduce the issue? How many wedges do you have setup and which ones? What version of minecraft? Are you using 4.0.2 of missing pieces? I have updated the wedge model to simplify it and cull some faces... should work better now. Please let me know how it works for you. Thanks for the heads up on this. I have posted a new version of 1.10.2 which addresses this one. You are a great field tester. Thanks for the version number, it always helps. In fact, it is intentional. The table is a simple block that happens to look like a table. In order to FUNCTION like a table and allow items to be placed on it, it becomes more complicated... like the shelf. It actually has to contain an item and render it for every frame. Mr. Crayfish did a great job with his tables... I just haven't gotten that far yet. I'll put it on my list to look at. thanks for the suggestion. Love this mod, always good to see new furniture mods. A bit of a suggestion/request, though: maybe you could make alternate table/chair options? I'm not too crazy on the spindle legs. Maybe have a carving knife that cycles through the different styles with a right click? There are two significant/hard parts to creating a piece of furniture: 1. figuring out the code behind creating it and it's functions (like sitting); 2. laying out the graphics for the model. I have #1 done. If you can point out or suggest some alternative designs, I can look at laying out the graphics for the new models. I can't remove the space entirely because the face and the rim graphics would fight for control of the overlapping area...but I can minimize it. Stay tuned for an update in the near future. Version 4.0.2 of this mod addresses the space issue on the ends of the pillars... Does it look better?